Italian eatery with huge portions and a lively atmosphere for fun and fine food. : This downtown Italian trattoria from the Stir Food Group takes its mission very seriously: not only can you browse through its compact wine store, but many of the DC workforce stop by for a morning cappuccino and baked goodies from its affiliated bakery. More earnest shoppers may pick up the day’s bread loaf and some gooey Italian pastry. 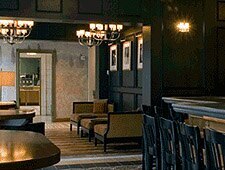 But most people at mealtimes crowd into the main dining room or cluster around the bar for some cozy chatting. The menu stars casual fare and you can enjoy some of the typical family-style, no-frills eats that grace Italian tables. Scan the menu and choose from antipasti, zuppa (soup), formaggi and salumeri (cheeses and cured meats), and finally the pasta, meat and seafood courses. The house favorite is one of the chef’s Sunday dishes, a lusty main course of rigatoni with short ribs, meatballs, sausage and ricotta. Other temptations: gnocchi with Gorgonzola sauce; Milanese-style pork with arugula; and a whole oven-roasted branzino. Of course, you can default to a pizza selection, but why not stick to the staples? Desserts? Tiramisu, cannoli and panna cotta lead the list.